More than 200 people attended the Caregiver Action Network event at USC Verdugo Hills Hospital last weekend. The Washington, D.C.-based Caregiver Action Network hosted the workshop as it has across in locations across the United States over the past few months in order to help family caregivers make medical decisions in tandem with health care providers. USC Verdugo Hills Hospital will host upcoming babysitting training classes for the community. 9 a.m.-2:30 p.m.; and Saturday, June 23, from 9 a.m.-2:30 p.m. The cost is $45 per class. To reserve a space, contact Family Education Coordinator Teri Rice at (818) 952-2272, or Teri.Rice@vhh.usc.edu. “A rising star among modern choral composers” (AXS), Trumbore’s newest work, “Infinitely and Without Apology,” was written to commemorate the 50th anniversary of the Women’s Committee of the Pasadena Symphony Association. This ambitious piece explores the idea of developing confidence, particularly — but not exclusively — as a woman. Trumbore addresses how women develop the kind of resilience it takes to share and project their voice in a world where they are often socialized to be quiet and take up minimal space. Following Trumbore’s world premiere, Israeli cellist Inbal Segev will perform Dvorˇák’s emotionally charged Cello Concerto. Guests can visit Symphony Lounge at Ambassador Auditorium’s outdoor plaza to enjoy uniquely prepared menus for both lunch and dinner at each concert from Claud & Co., fine wines by Michero Family Wines, plus music before the concert and during intermission. Pre-concert discussions with David Lockington and Dale Trumbore begin one hour before curtain and are available to all ticket holders at no cost. All concerts are held at Ambassador Auditorium, 131 South St. John Ave., in Pasadena. Subscription packages start at $99. Single tickets start at $35 and may be purchased online at pasadenasymphony-pops.org or by calling (626) 793-7172. Dignity Health — Glendale Memorial Hospital Chief Medical Officer Dr. William Wang shows the students the large teddy bear. Dignity Health recently partnered with Kids for Peace to sponsor the 2018 Great Kindness Challenge. Now in its fifth year, this global program aims to inspire students to make a lifelong commitment to service and kindness. The event challenges participating students to complete a checklist of 50 acts of kindness in one week, including such things as holding the door for someone, helping a friend or picking up trash. This year, physicians and staff from Dignity Health — Glendale Memorial Hospital taught students at Cerritos Elementary about the healing power of humankindness. Physicians led a “Teddy Bear Clinic,” showing students how to listen carefully while displaying compassion for others. Students also decorated “Thinking of You” cards, which will be delivered to area fire stations as a thank-you to the thousands of firefighters who recently battled the California wildfires. 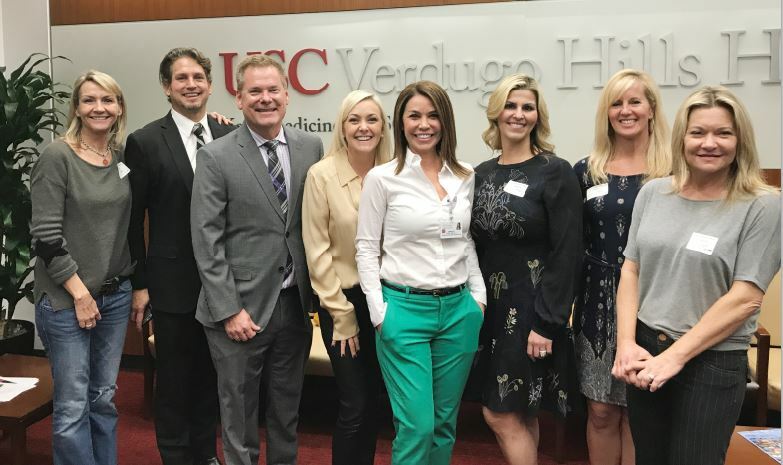 Tracie Heileson, Chris Benz, USC Verdugo Hills Hospital CEO Keith Hobbs, Kim Suarez, Marcie Sabatella, Sandy Kobeissi, Julie Milbrodt and Gillan Abercrombie Frame gather for lunch and to tour the hospital. The intent of the recent “lunch with the CEO” was to help spread the word with Realtors in the community about the strides that have been made in the quality of care and breadth of resources that are available to residents as a result of the resources that Keck Medicine of USC has been able to bring to La Cañada Flintridge. Not pictured: Heather Scherbert and Ellie Yoon. Flintridge Bookstore & Coffeehouse will welcome Gabriel Gale, creator of “Ages of Oz,” on Monday, Feb. 5, at 4 p.m. The book is an adaptation and expansion of the “Oz” that everyone knows and loves. “Ages of Oz” tells the story of Glinda’s transformation from a 13-year-old student uncertain of her future to the most powerful magician in all of Oz. The series addresses social justice and the importance of independent thinking during tumultuous political times in which illusion, fear, terror, distraction and unlawful imprisonment rule. At this after-school event, Gale talks with publicist Rene Makrinos; signs the trilogy’s first book “A Fiery Friendship”; and gives a preview of Book 2, “A Dark Descent” (releasing May 2018). Both titles are written by Lisa Fiedler and illustrated by Sebastian Giacobino. Flintridge Bookstore and Coffeehouse is located at 1010 Foothill Blvd. For more information, call (818) 790-0717. The USC Verdugo Hills Hospital Women’s Council will host a “Drag Queen Bingo” fundraiser on Friday evening, Feb. 2, at the La Cañada Thursday Club. The event, which will raise funds to benefit the new Neonatal Intensive Care Unit at USC-VHH, runs from 5:30-8:30 p.m. Admission is $50 per person, which includes 10 rounds of bingo, heavy hors d’oeuvers and two drink tickets. Participants will be able to win $100 gift cards during each round. There will be a silent auction for the shoppers and photo booth for dressing in style. Sponsorship opportunities are available. For more information, contact Barbara.Jordan@vhh.usc.edu to RSVP. The Pasadena Symphony and principal guest conductor Nicholas McGegan presents “Baroque Around the World,” on Saturday, Jan. 20, at Ambassador Auditorium. Highly regarded as “one of the finest baroque conductors of his generation” (London Independent), the two-time Grammy nominee will jump-start the new year with his performance. 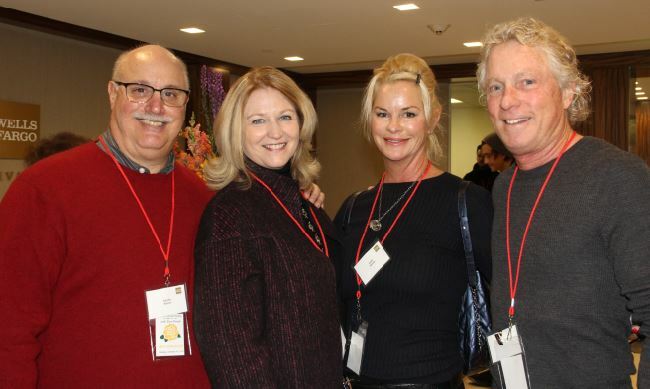 La Cañada Flintridge residents Sandy Slater and Wells Fargo Private Bank Regional Managing Director Kay Wolking are joined by Sally and Steve Mann as they enjoy the 129th annual Rose Parade at the bank’s annual viewing party. The prime location overlooks Colorado Boulevard from Wells Fargo Private Bank’s third-floor offices and terrace. 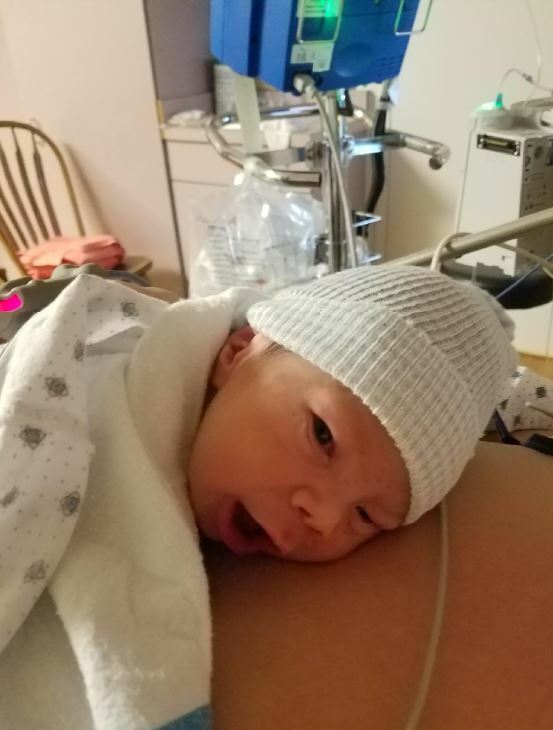 USC-Verdugo Hills Hospital welcomed Baby Amador as its first arrival in 2018. The boy was born at 7:34 p.m. on Jan. 1 to Heidi and Oscar Amador, joining stepsister Addison. The baby boy weighed 7 pounds, 10 ounces.